Let's hope we can beat this! Here is a video of the record holding bridge. LATROBE, PA – An engineering competition for area high school students, co-sponsored by Carbone’s Restaurant of Crabtree and the Herbert W. Boyer School of Natural Sciences, Mathematics and Computing at Saint Vincent College, will be held at 6 p.m. Monday, March 7 in the Fred M. Rogers Center. The public is welcome to watch as miniature bridges made out of uncooked pasta are loaded with increasing weights until they collapse. The Saint Vincent College Engineering Club is assisting with arrangements for this year’s competition according to club president Ande Greco. Forty-one teams representing nine Westmoreland County high schools will participate in this year’s contest including Derry Area, Franklin Regional, Greensburg Central Catholic, Greensburg Salem, Hempfield Area, Jeannette, Norwin, Penn Trafford and Yough. Judges for the competition will be Matt Burns of Gibson-Thomas Engineering, Melanie Berry of Michael Baker International and Dr. John Smetanka of Saint Vincent College. The competition is designed to increase high school students’ awareness about the role engineering plays in their lives and the career opportunities in the field and to provide an opportunity for students to collaborate on the design and construction. Saint Vincent College, a top-ranked private liberal arts catholic college located in the Laurel Highland of PA, offers undergraduate and graduate degrees, as well as teaching certifications and cooperative programs in the health professions. Students are asking...How much will my bridge hold? Bridges are being built for the 2015 Pasta Engineering Contest. Carbone's is once again proud to sponsor the contest. This engineering challenge is designed to increase high school students' awareness about design, fabrication and careers in engineering. The purpose is to have the students work together to determine the best strategy using the provided materials to design and construct the strongest bridge. The competition and award presentation will take place on Monday, March 2nd, 2015 at 6:00 pm. At Saint Vincent College's Events and Conference Center at the Fred Rogers Center. Students, their parents, and everyone else are invited to join us for the judging of the bridges. We are anxiously waiting to see who can build the bridge that will break the current record of 109 pounds set in 2011. If you want to see pictures of that bridge they are on our facebook page. Photos from the last two contests are on the Saint Vincent College flikr page. Engineering professionals from local business along with a representative from Saint Vincent College will serve as judges. BREAKING NEWS --- St Bartholomew's just announced the dates for this years Our Lady of Mt Carmel Festival. 2014 Even though the fireworks tonight have been cancelled, the grounds are still open. Come on out and play some games and support St Bartholomew's Church. Carbone's Restaurant will be open. No rain date is scheduled per festival policy. Carbone's will be closing at 8:00pm on Saturday, July 19, 2014 so that our staff and patrons can enjoy the Saint Bartholomew Church of Crabtree's Our Lady Of Mount Caramel Festival fireworks that begin at 10:30pm. They are available every day in Lent. Due to the impending weather the Pasta Engineering Contest has been rescheduled for Monday, March 10, 2014. We would like to thank the students, teachers, Saint Vincent College and the community for their understanding. Please be safe and stay warm through the upcoming winter storm. Carbone's will be closed Tuesday, January 28, 2014 because of the severe weather conditions. How has the new year been treating you? Is it time to treat yourself to some Carbone's Restaurant either come and eat with us and we will do the dishes or take some home and cuddle up by the fire. Carbone's is closed December 24 and 25 for the Christmas Holiday. Enjoy the day with family and friends. We will reopen at 4:30pm on Thursday, December 26, 2013. Thank you for helping us celebrate! The Carbone Family and Staff would like to thank everyone for making our 75th Anniversary week so special! Our 75th Anniversary Celebration is fast approaching! Join us November 11th through November 14th for a different event every day. Also, browse our 75th Anniversary commemorative merchandise! Carbone's logo pint glasses and pasta servers and tee shirts designed by local artist (and cousin) Raphael Pantalone! Great homemade Italian food. Carbone's has been attracting hungry diners from all over Western Pennsylvania for more than 75 years. Generations of guests have been enjoying homemade recipes created by founders Nat and Mary Carbone since they first opened their cozy restaurant in 1938 in the first floor of the Crabtree community building. The original building may be gone, but not the delicious homemade food that has made Carbone's famous: spaghetti sauce; lasagna; gnocchi; ravioli; pizza; italian salad dressing; onion rings; beef braciole; eggplants; chicken and veal parmigianas; Caruso sauce; pepperoni sauce and many more. Did you know that Carbone's has a large banquet room that is just perfect for your special celebration? Choose from Full Service, Buffet or Family Style menus. Carbone's is available for breakfast meetings, luncheons, and business meetings upon request. Contact Natalie for more information. Available for luncheons and Sunday banquets. Join us at the Boy Scout Pasta Dinner Fundraiser this Sunday, October 13, 2013. CALL NOW, Limited seating available!! Just a few pictures to help you guess the weight. Stop by and submit your entry by October 12th. Grandpa would surely be proud of Vince for this watermelon! 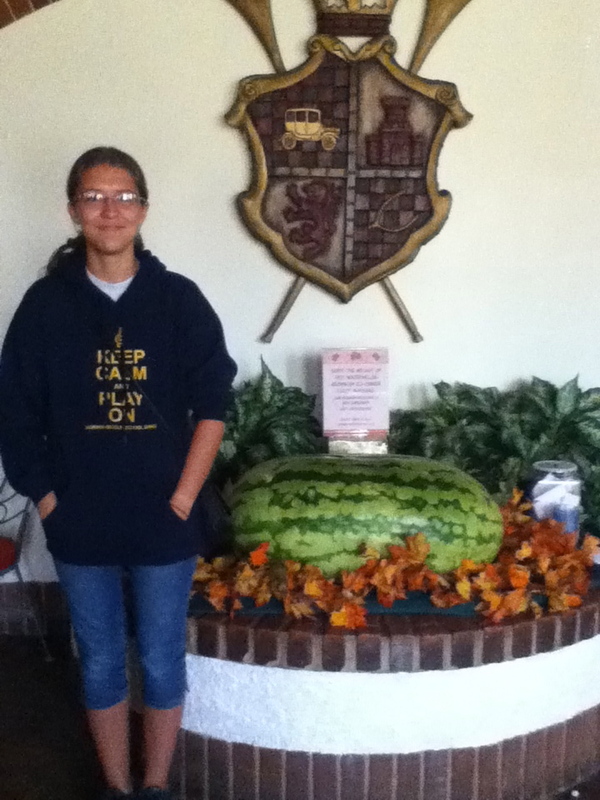 Make sure that you fill out your entry form and guess this watermelon's weight. Just to give you some help it is 34 inches from end to end! Autumn is my favorite time of the year, not only because of the beautiful hues of the changing leaves and the crisp Fall air, but because of Carbone's many new menu items! We have a variety of seasonal beers such as Sam Adams Octoberfest, Blue Moon Harvest Pumpkin Ale served with a caramel and brown sugar rimmed glass, and Pittsburgh Dad's 3-2-1 Win Craft beer. Back by popular demand are the Pumpkin and Mascarpone Ravioli served with a Sage Brown Butter Sauce. Of course, you had better save room for one of the fabulous Fall desserts, such as Pumpkin Roll with Sweetened Cream Cheese filling, Warm Apple Cobbler with Vanilla Ice Cream and Caramel Sauce, Salted Caramel and Almond Cream Puff, and good old-fashioned Pumpkin Pie! In anticipation of our upcoming 75th Anniversary Celebration we are asking our Facebook friends to share some of their favorite memories of Carbone's Restaurant. We will draw 3 random winners from all of the entries to win gift certificates.